Special Olympics athlete Eric Baumann of Vienna has joined the Special Olympics Illinois Board of Directors and will serve on the Sports Training & Competition Committee. Eric previously served on the Board from 2008 To 2011. Eric has participated in Special Olympics since 1995 and has won more than 100 medals in various sports. He participates in athletics, basketball, bocce, bowling, snowshoeing and softball through Family Counseling Center, START and Choate. Eric graduated from Vienna High School in 2002 and currently works full-time as a janitor and in landscaping at the Trail of Tears Rest Areas on Interstate 57 in Southern Illinois. Eric’s athleticism is not the only trait that has surfaced through his participation in Special Olympics. He has become a bigger part of the community by involving himself in more than just sports. Eric is now not only an athlete, but a Global Messenger, a volunteer, a coach, has served on the Board of Directors and was nominated for the Special Olympics North America Athlete Leadership Council. 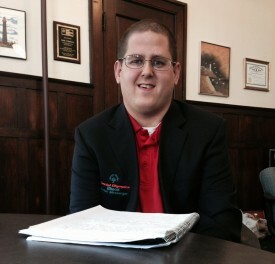 As an active member of the organization, Eric says that Special Olympics has transformed his life by making him a better person and has helped him set new goals for himself and his future. Eric volunteers for Special Olympics locally as much as possible. He also volunteered at the athletics venue with his mother Kathy at the 2010 National Games in Nebraska and has worked with the Young Athletes Program. Other than competing, Eric’s favorite part about Special Olympics is spreading the word of Special Olympics. Being a Global Messenger has made Eric a more social person and has brought him out of his shell, which is exactly what the movement is meant to do.